When you make your appointment for your annual wellness visit with your physician, don’t forget to call the eye doctor for a checkup! This is especially important for the nearly one quarter of the American population that makes up the baby boomer generation. In a recent survey of adults ages 45-65, over half of the respondents say they don’t usually have an annual eye exam, and even less than that know the importance of key nutrients that play a significant role in eye health. Taking the steps to get those nutrients is easy. “As we grow older, the need for certain vitamins and nutrients to support the eye increases,” says Dr. Jeffrey Anshel, president of the Ocular Nutrition Society. * Some of these nutrients include omega-3 fatty acids and lutein. Because our bodies do not naturally produce lutein & omega-3, the best way to get them and other important vitamins & nutrients is through natural food sources, including eggs. 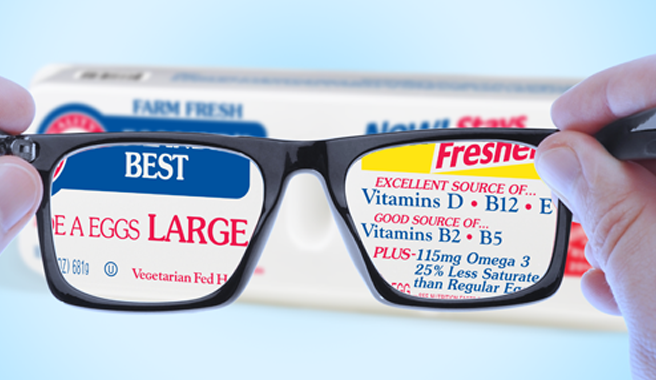 When you eat Eggland’s Best eggs, you’re getting 38% more lutein and double the omega-3 than ordinary eggs. Making simple changes to our diets to include foods that are more nutritious can have a big impact on our overall health & wellness.